Some things in life are unfair. For instance, the French New Wave was such a groundbreaking – as well as self-promoting and over-documented – movement in the history of film that even its marginalia remains more widely viewed than certain national cinemas. 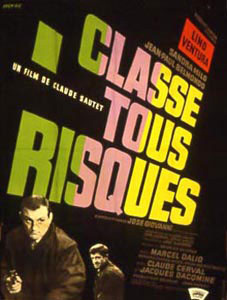 So while cinephiles pine away for a Belarussian or Jordanian film festival to introduce them to the treasures of those countries, Claude Sautet's dawn-of-the-New-Wave gangster exercise, Classe Tous Risques, gets resuscitated for reevaluation with a new print at New York's premiere art theater, Film Forum. There are surely richer neglected areas of the French New Wave territory yet to mine, but Classe is not an entirely unfounded revival – nor an entirely uninteresting film. Providing nostalgic comfort in its dutiful adherence to genre conventions, Classe Tous Risques remains a product of its time without ever really transcending it. B-list legend Lino Ventura plays weary criminal legend Abel Davos, who witnesses his wife and partner cut down during an escape from Italy after a brazen heist job. Stuck in the Riviera with his two young sons as the police close in, Davos must rely on his former Parisian vice pals to deliver him home. But fearing the heat this risky venture might bring to their now legitimate enterprises (thus the title, an untranslatable pun that has usually been rendered as The Big Risk), his comrades leave the driving to none other than Jean-Paul Belmondo, in his first post-Breathless role, as the independent hood, terrifically named Eric Stark. Sautet films the story with a non-winking reverence toward his material – all the tropes and conventions of the 50s and 60s French obsession with American gangster flicks get played out economically and with a resigned and deliberate pace. But it's Sautet and Classe's relationship to the New Wave that's actually more interesting than the film itself – whether Sautet went with or against the changing tide in French film has always been debatable. While rival film journals Positif and Cahiers du Cinéma have fought over the relevance of Sautet – with the former championing and the latter dismissing – in 1960 his earnest yet too polite interpretation of the film noir idiom had him receiving negative comparisons to the New Wave's innovative takes on what were becoming curdling formulas. That comparison can't help but avoid being made now. Indeed, when watching Classe it's difficult to avoid thinking of Breathless, as well as American-crime homage exercises by Truffaut and Chabrol, and New Wave-related entries from Bresson and Melville (both clear influences on Sautet). The giddy exuberance that made Breathless and Shoot the Piano Player classics goes noticeably missing from Sautet's film; the severity and real existential inquiry of Pickpocket and Bob the Gambler are only suggested by Sautet's attempts to imitate these qualities. What we're left with 45 years after Classe's awkwardly timed entrance into French film history are some superbly assured performances and well-drawn characters. Ventura's steely composure and brooding pessimism are portrayed with a lived-in subtlety. Belmondo unsurprisingly steals the show as a thief with humor, class, and morality. But what's most admirable in Classe is Sautet's warmth. Even at the beginning of a career that would be comprised of films mostly centered around relationships, Sautet's strong suit was his humanistic treatment of people in dire circumstances – although slain cops are conveniently forgotten as we admire Davos's loving, if flawed, connection to his sons. Nonetheless, his ability to refrain from gangster parody yields stereotype-resistant characters. Davos and Stark's unspoken mutual admiration is one of the great, understated friendships in a genre more reliant on the cynical and parasitic type. And the betraying ex-partners aren't simply rats. They may be sell-outs by embracing propriety, but Sautet renders their actions as completely understandable practicalities – which in turn make Davos's acts of retribution come across as troubling and unsympathetic. Meanwhile, Stark's subplot-relegated love affair with a young actress is, thanks in part to Belmondo and Sandra Milo's palpable chemistry, effectively touching. Those are the faint traces of a good, if not a standout, director. Melville wrote in 1962, “I am not opposing the Sautet technique and the Truffaut technique: absolute classicism and the new cinema are two forms of the same art. It remains to be seen if, in 1965, both will still exist or if one, alone, will still exist.” History saw Truffaut & Co. win out in the arena of popular and critical acclaim. So maybe it's fair that a modest, nearly unassuming work like Classe Tous Risques be given another chance after all.